A longtime listener of WFNX, my ears perked up a few weeks ago when DJ Julie Kramer and The Sandbox were on air waxing rhapsodic over chocolates from Turtle Alley, a chocolatier with locations in Gloucester and Salem. I looked up the company online, and one glance at their press, which includes kudos from the omnipresent Rachel Ray, made me realize that we at the Dish were apparently the last people on earth to find out about the infamous turtles. Eager to rectify the situation, we headed over to the Salem store, located in the unfortunate Museum Place Mall, to try the tasty terrapins. 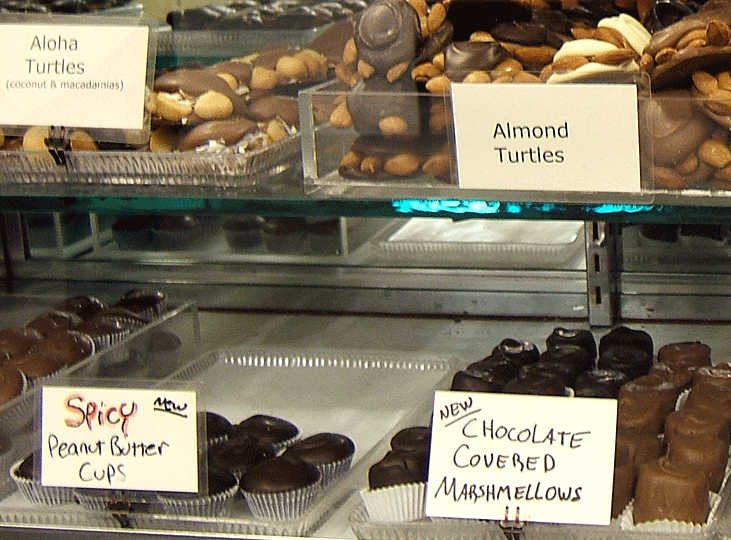 The store’s owner, Hallie Baker, handcrafts the chocolates in small batches with the freshest ingredients available and offers an impressive variety of turtles, barks, peanut butter cups, and other confections. We appreciated the fact that the turtles are available made with almonds, cashews, pecans and even macadamia nuts. The chocolate was rich and even, and the caramel was soft and buttery. Like many chocolate makers today, Baker isn’t afraid to experiment with interesting taste combinations, the results of which piqued our taste buds as well as our interest. 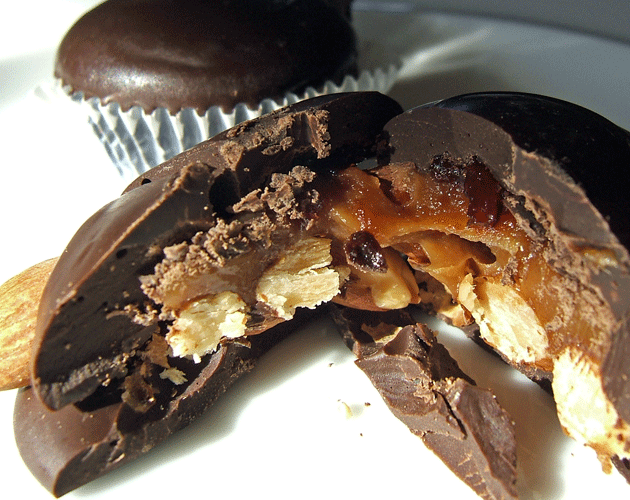 While the basic turtles were enjoyable, the real stand-outs were the spicy peanut butter cups and the almond chipotle turtles. The peanut butter cups start out subtly, and then the mix of smoked paprika, cayenne pepper, chipotle, and a secret blend of spices create a warm, almost autumnal infusion of taste. The heat in the turtles is more straightforward, provided by a layer of chipotles and adobo tucked in between the chocolate and the caramel. When you bite into that, you’ll know it. Nowhere is the spice overwhelming, though—we found the savory combination of sweet and hot balanced and quite pleasing. If spicy chocolate isn’t your thing, Turtle Alley’s other offerings range from solidly respectable to wonderfully delectable, the fleur de sel caramel and the chocolate-covered coconut being the most memorable. The company’s line of candy fruit slices blow away the supermarket variety—we tasted the new pomegranate flavor, which was juicy and flavorful. Turtle Alley’s motto is “Life is short. 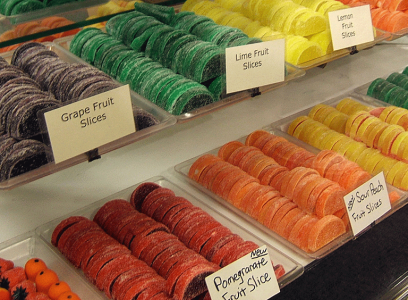 Sin a little” but after tasting some of these confections, a little might not be enough. That first photo is a chocolate dream! I’m very interested in the almond chipotle turtles as I adore a spicy/sweet combo. Glad you liked the “up close and personal” photo approach. Ever since a friend gave me a recipe years ago for cayenne dark chocolate truffles, I have been a big fan of hot and sweet chocolates. If you know of any others locally worth checking out, I’d love to hear about them!